The Linnet, Carduelis cannabina, is a small passerine bird in the finch family Fringillidae. This bird breeds in Europe, western Asia and north Africa. It is partially resident, but many eastern and northern birds migrate further south in the breeding range or move to the coasts. Open land with thick bushes is favoured for breeding, including heathland and garden. It builds its nest in a bush, laying 4-7 eggs. This species can form large flocks outside the breeding season, sometimes mixed with other finches, such as Twite, on coasts and salt marshes. Its food mainly consists of seeds, which it also feeds to its chicks. 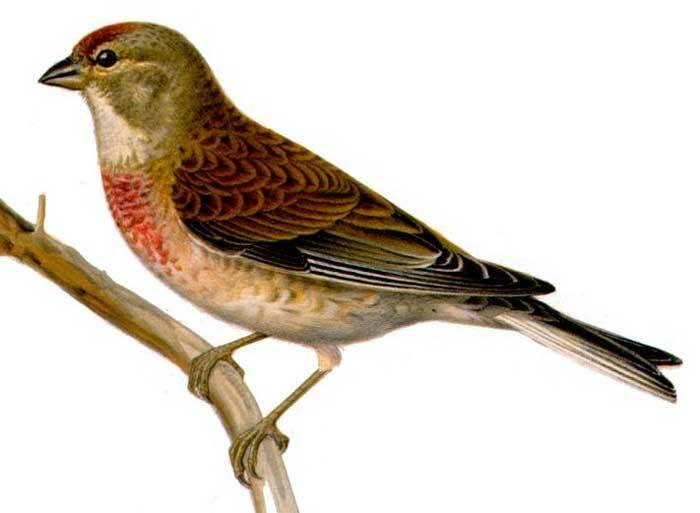 The linnet derives its scientific name from its fondness for hemp and its English name from its liking for seeds of flax, from which linen is made. It is a slim bird with a long tail. The upperparts are brown, the throat is sullied white and the bill is grey. The summer male has a grey nape, red head patch and red breast. Females and young birds lack the red and have white underparts with the breast streaked buff. The linnet's pleasant song contains fast trills and twitters. They are sometimes found several hundred miles at sea. They feed on the ground, and low down in bushes. They like small to medium sized seeds: most arable weeds, Polygonums (Knotgrass, dock), Crucifers (Charlock, shepherds purse Capsella bursa-pastoris), Chickweeds Stellaria, Dandelions, Thistle, Sow-thistle, Mayweed, Common groundsel, Common Hawthorn, Birch. They have a small component of Invertebrates in their diet. The Linnet is IUCN Redlisted as threatened and also listed by the UK Biodiversity Action Plan as a priority species, which can be found here.It is protected in the UK by the Wildlife and Countryside Act 1981. In Britain, populations are declining, attributed to increasing use of herbicides, aggressive scrub removal and excessive hedge trimming; its population fell by 56% between 1968 to 1991. This was probably due to decrease in seed supply and increasing use of herbicide being two of the factors.